The first Cash Bandits Slots is one of the most popular Real-Time Gaming casino games of all time. Real-Time Gaming Software released the first version in 2015. Those Cash Bandits pulled off a successful heist and walked away with tons of money. They are back in June 2017 and ready for a bigger heist to get their adrenaline going and steal even more money. 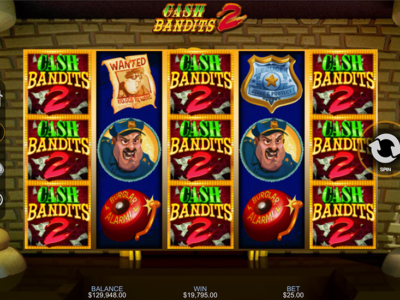 Cash Bandits 2 Slots features five reels with twenty-five pay lines. Real-Time Gaming software powers the highly anticipated sequel that has many ways to win. The second versions are even more enjoyable to play on home computers and mobile devices. Win big multipliers, jackpot Cash, wild symbols, one hundred ninety free spins, scatter wins and bonus rounds. Try your hand at winning two random progressive jackpots! 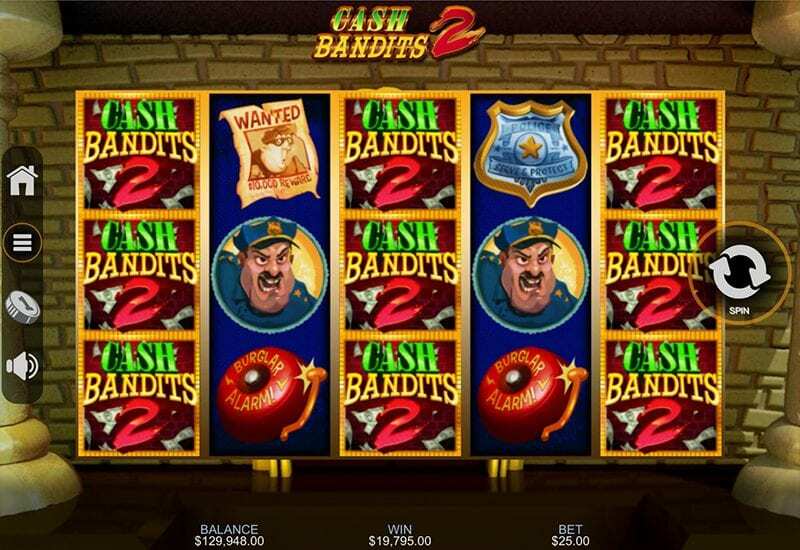 Cash Bandits 2 Slots has incredible three-dimensional animated graphics. Real-Time Gaming casinos did a great job developing this game, and we are excepting it to be a bigger hit than the first version. Enjoy Cash Bandits 2 online slots with real money or using the Bitcoin digital currency with as little as one cent per spin. The game has a nice sized betting range, which makes it ideal for all players. One hundred twenty-five dollars is the maximum amount you can bet per spin. The symbols on the wheels have amazing three-dimensional graphics, and the soundtrack that plays fits with the game. Enjoy seeing the two Cash Bandits on the wheels and some other icons from the first match. The cartoon-like style images you will see are the tools to pull off the robbery and get away from the police. Don’t be surprised if you see the cops, handcuffs, bags filled with money, wanted dead of alive posters and police badges. Win 50,000 coins by landing the right combinations and helping out the thieves get away with their master robbery that is bigger that last time. Naturally scoring any three matching symbols will yield a win. However, there are some huge wins in this game so keep spinning.